The Yankees first pick in the 2014 MLB First-Year Player Draft was left-handed reliever Jacob Lindgren with the 55th pick. He is ranked number 50 overall by Baseball America and was described by MLB Network as one of the few players that could possibly see big league action right away. Lindgren was drafted in the 12th round by the Cubs in 2011, but opted for college instead. He was a starter for three years at Mississippi State University, then was converted to a reliever this year. His career numbers as a starter at MSU were 12-6 record with 89 Ks and a 2.64 ERA. Lindgren had a successful breakout 2014 year in the bullpen. In 26 outings Lindgren is 6-1 with a team record 0.81 ERA, a whopping 100 strikeouts to just 25 walks over 55.7 innings pitched. He is a very good ground ball pitcher according to CollegeSplits, he recorded a 79% groundball ratio, good enough for second overall in NCAA Division 1 baseball. Lindgren has two pitches that could be considered big league stuff right now, since being moved into the bullpen his fastball has topped out at 95 MPH at times, but his strikeout pitch is his 85 MPH slider. He is a hard throwing lefty that could be used as the LOOGY or maybe as a multiple inning guy. I think the Yankees will probably groom him into more of a strong general weapon out of the pen, with the prospect of becoming a LOOGY down the road. He does have a bit of a command problem, but it’s nothing to be worried about. After doing some research this year on the draft, the Yankees made a safe pick taking a college player over their usual high school player, while having the college experience doesn’t guarantee much, it’s always a safer bet in the world of scouting young baseball talent. With Matt Thornton having a rough season, there a chance he could make his MLB debut this year, but the more plausible scenario is we see him in 2015. Jacob has been very successful in a tough conference and has produced exceptional strikeout numbers, We are very happy to have selected him. Jacob has two Major League pitches that are above average and possess swing-and-miss quality. He has been extended for multiple innings and holds his stuff consistently. 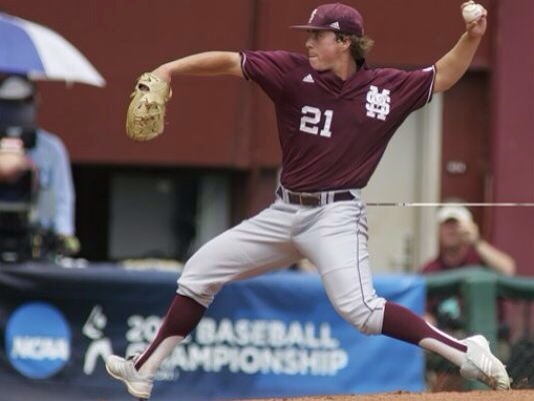 Mississippi State finished runner-up at the 2013 College World Series runner-up club, with much of the Bulldogs’ success coming from building their pitching staff around their relievers. After losing several of them to pro ball, they moved Lindgren to the bullpen this spring. He has over-matched hitters more than ever in shorter stints, making it unlikely that he’ll last past the second round of the Draft. His best pitch is a wipeout slider that arrives at 82-84 mph with late bite. His fastball has jumped from 87-91 mph as a starter to 91-95 as a reliever. Because Lindgren has a sinking changeup and throws strikes, a pro team could be tempted to develop him as a starter. But his stuff plays up as a reliever, and he could reach the Majors very quickly in the role. He has closer upside and is almost MLB ready.